Translated from Sore de Honto? The uniform image of a yurei has come from the Middle Ages to the modern day. But in the earlier days, at a time when people were mortally afraid of the power of spirits, yurei actually had feet. The image of a footless yurei, known as the ashi ga nai yurei, became established in the Edo period by kaidan tales like “Yotsuya Kaidan” and “Bancho Sarayashiki.” But even before these kaidan, the footless yurei had gained popularity in the works of artist Maryuama Okyo. (1733-1795). His paintings were so overwhelmingly popular that they influenced the designs of the kabuki stage, until Okyo’s image of the yurei became the accepted form of Japanese ghosts. But why did he paint his yurei without feet? There are several proposed explanations. One says that his images were drawn in dim light, that only illuminated the top half of the person leaving the legs and feet in darkness. Keio University professor Ikeda Yasaburo proposed the theory in his book “Nihon no Yurei” that Okyo was inspired by the haze of incense smoke rising into the sky, and drew his yurei as if they were half composed of this smoke. Another theory looks at the long robes of Bunraku puppet theater which hide the feet of female puppets. Kabuki theater took inspiration from Bunraku, and it is possible that the hidden feet of the puppets was adopted into live theater. It is most likely that from one or more of these explanations comes the popular image of the footless Japanese ghost. …and yet, it cannot be said that all yurei are footless. You can often hear the sounds of ghostly footsteps in traditional kaidan stories. 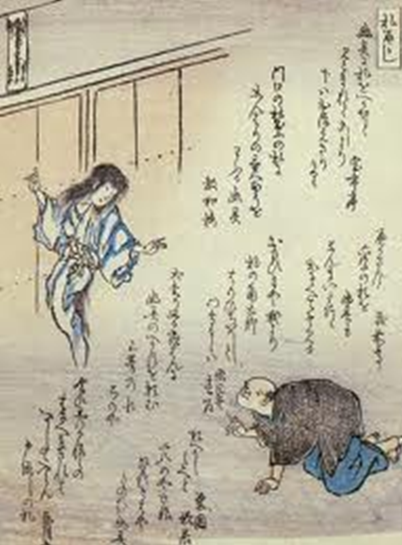 In the popular kaidan Botan Doro the arrival of the yurei Otsuyu is announced by the karan, koron of her wooden geta sandles. And in Noh theater, many of the ghostly characters sport magnificent footware. Of all the bakemono and yokai in Japan, the kappa is the best-known. Depending on the area, they might be known as “gataro” or “kawako” or “gawappa.” This just shows how wide-spread they are. As for appearance, the most stereotypical kappa can be recognized by the indented bowl on his head and by webbed hands and feet. There are many people who claim to have seen this kind of kappa. But if you research exactly what people describe, it seems like what they are actually seeing is an otter. Otters come from the mink family, and have a large tail. They can use this tail for support to stand straight up on the river banks. When they do this, they are almost exactly the same size as a human child. An otter’s skull is soft, and can be flattened out at the top. Just imagine coming upon an otter in the dim evening light, standing upright on a river bank. Water running off its fur, the head flattened out and eyes moving around restlessly, standing at the same height as a human child. Don’t you think it might look just like a kappa? In the Edo period, if you examine all of the different portraits of kappa, you can see the influence of the otter’s shape. For example, the picture called “Suiko, scroll #20” is obviously a mix between an otter and a turtle. The distribution of otters in Japan and stories of kappa coincide, from Hokkaido down to Amami island. But nowadays, otters are almost extinct in Japan. I wonder if the legend of the kappa will fade along with them?